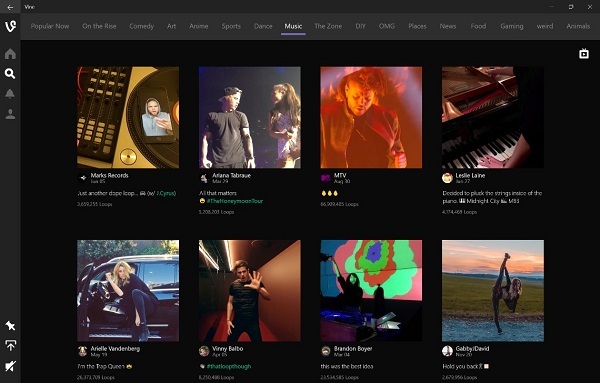 Vine launches app for Windows 10 PCs and tablets. Vine has today launched a new app for Windows 10 PCs and tablets. Beginning today you can download Vine from the Windows Store. The app includes some great Windows 10 features like Live Tiles, an adaptive UI, and Drag and Drop. Vines play back to back, similar to the experience you get when you use the Watch button in the mobile app. If you want to make a post loop so you can watch it over and over again, mouse over it or touch the screen if you have a touch-enabled device. You can also create and share a Vine of your own by uploading a video from your PC.